Stuffed Breakfast Sweet Potato: Three Ways! Phew, for a while there, I thought I was never going to hit publish on another (food) blog post! I had some serious writers block and a lack of creativity that I just couldn’t shake, but for now luckily that seems to be over. And thankfully this stuffed breakfast sweet potato has entered the picture. To be fair, over the holidays, all I wanted to do was chill and not cook/create things for anyone but me. Sorry, not sorry. It takes quite a bit of work to create something, test it, tweak it, write it down and then publish a story about it and I just wanted none of it. I made some pretty good meals, but I kept them for myself and got back to just creating things on a whim without the thought in the back of my mind about whether or not this would be “Holistic Foodie approved” or Instagram worthy. After trying the whole paleo thing for about 2 weeks, I realized how hard it is to do! I know, 2 weeks is not even very long and I really wanted to stick with it, but I just couldn’t do it. I felt like I was so focused on trying to have protein all the time and it was stressing me out. Also, being someone who doesn’t particularly like eating meat all the time, it felt forced and I just wasn’t enjoying it. So I have decided to allow grains back into my diet, although I did notice I feel better not having grains very often, so I am making a conscious decision to avoid having them all the time. I find that when I do have grains, breakfast or lunch are better times for me and then having a grainless dinner is best. In the morning, I like a hearty breakfast such as this hemp oatmeal, especially in the colder months. As much as I love my smoothies, sometimes, all I want is a bowl of warm stovetop oats. It gives me all the feels! 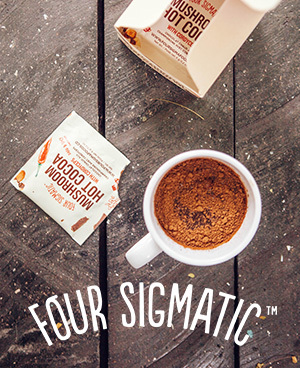 So we are officially in cold and flu season and I don’t know about you, but I think its a great idea to boost your immune system as much as possible to avoid getting sick, cue this four sigmatic hot cocoa. Long before I became a Holistic Nutritionist, I was always getting sick, every time a cold or flu went around I got it without question. I can actually remember joking with a friend in university about what the weakest part of our bodies were (I don’t recall how this conversation started lol) and I said “my immune system” and pretty much if someone sneezed near me, I would end up getting sick. I went through university and beyond like this and battled more flus and colds than I cared to. It wasn’t until I cleaned up my diet that I saw dramatic changes and now I rarely if ever get sick. Even when I do catch a bit of a cold, it’s nothing like other peoples and mine only lasts a couple of days at most. So in this post, I thought it would be a great idea to share with you my top tips to avoid getting sick and boost your immune system plus I’m sharing the recipe for this four sigmatic hot cocoa. In my last post, I spoke about trying a new paleo-ish diet to heal myself from some digestive issues I have been experiencing for far too long. Being someone that doesn’t want to have meat for every meal, I needed to find a balance with my breakfasts and compromise on my cravings for oatmeal and my adherence to a paleo diet. Obviously, oats along with other grains and wheat are not allowed on a paleo diet, so I knew that I would have to find an alternative. After much digging around online, I found a few recipes that use shredded unsweetened coconut as the oat alternative. People are damn geniuses when they have dietary restrictions, I tell you and can come up with some pretty solid recipes, tips and tricks. This paleo coconut oatmeal is one of them! If you can still manage to find some in-season peaches, you need to make this quick healthy vegan breakfast ASAP! I have been enjoying this breakfast for a couple of weeks and I cannot stop eating it, overnight oats anonymous right here! This can be yours in the morning if you take 5-10 minutes to prep this the night before. Not going to lie, I am a little sad that summer is ending soon, but that does mean we are moving into fall here in Ontario and that is one of my favourite seasons, yes bring on all things pumpkin and squash! When you make breakfast that tastes like dessert but is actually healthy for you… (*mind blown*). These cherry overnight oats are insanely good and if you are already a fan of overnight oats then you are in for a sweet treat! When I tasted the first bite, it tasted like chocolate cake with cherries, which would be similar to black forest cake, except I always hated black forest cake so I don’t really know what to make of that. It is the best recipe for overnight oats I have ever tried and I have tried them all.